It appears to have been a quiet month, race-wise. Don’t be fooled though – some of our veteran ladies and gents have been leading the way in the Kendal Winter League, with a special mention to Jean Brown (who seems to be amazing at evey discipline), Wendy Dodds (two 1sts), Linda Lord (a 1st at Giggleswick AND 2 Parkrun PBs), Katy Thompson, and Jack Holt. 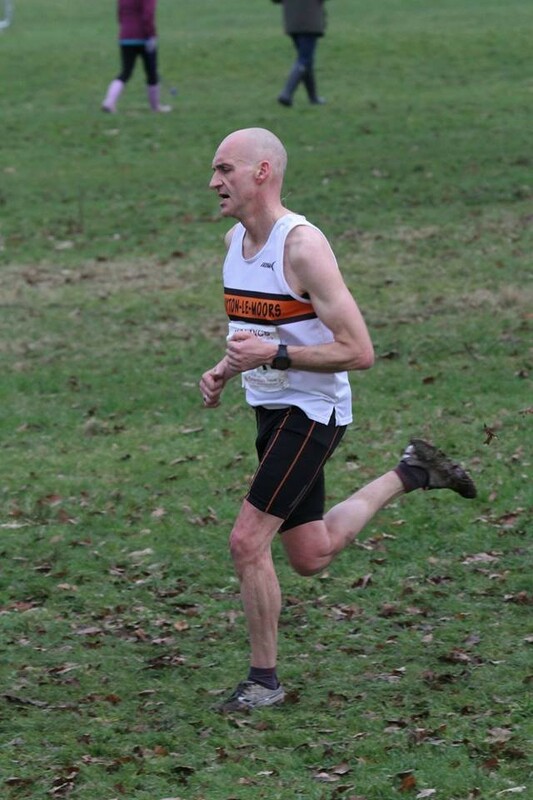 VM75 David Scott was also victorious at Lancashire Cross Country Championships – see his race report further down. 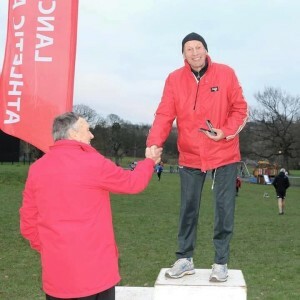 As a special feature, I asked David Edmondson, who recently won an England vest for 10K, to write about how he has managed to improve his form over recent years. I hope you find this interesting and useful. As ever, many thanks to all our contributors for helping make the roundup possible. Cheers! I have been running competitively for over 40 years, to a moderate level of success. Frequently plagued by injury; like most. Especially over the last few years, maybe it’s inevitable? Since 2013 I’ve never felt like I was running well. Now my wife Tracy who has been teaching Pilates for 14 years has been pointing out areas of improvement for some time, in particular to do with posture and dynamic posture: running gait in other words. You can see some of the faults in the cross country picture. Over the last few years something has clicked, maybe my engineering background helped. We are very much design to run so why do we frequently get injured? I put months of thought and analysis into the problems a couple of years ago. In fact I enjoyed that so much I eventually resigned form my teaching career to join Tracy teaching Pilates. Some of my classes specialising in Running. What did I find was the solution to my problems? A real concentration on getting that posture right, improving stability, running gait and crucially, ensuring my glutes are not only strong but firing properly. I’ve slowly altered my running gait, minimum necessary change each time. Much of these gains made through Pilates with some work that I’ve called Pilates Plus; the same principles but with weights or resistance. The picture form Telford 10K perhaps demonstrates some of these improvements; still with some gains to be made. How have I improved? I returned to road running last summer after perhaps 3 or 4 races since 2009. My 4th road race of 2018 I ran 10 miles in just over 63 minutes to grab the V50 Lancashire 10 Mile Champs and a few weeks later ran just over 37 minutes at the Telford 10K to get an England selection. Not stunning times but over the last 12 months I’ve only averaged 25 miles a week; my lowest average for some years! Now I have the correct movement patterns, stability and strength I can begin building the mileage up again and we’ll see what I can do? I’m running for England V50 10K team in May and then hope to focus on an Autumn marathon; aiming for an England vest at that distance. It was a cold January Saturday, with rain forecast for the afternoon, so my usual stalwart supporter, Jill (aka Dave Scott’s wife) decided not to come. I first ran in the Lancs. as a Senior in 1965 and have run numerous times since. In those days, I was more concerned about my position, but in recent years I now look at how many runners are behind me when I finish. As a Vet60, I beat 30, and then steadily the numbers dropped to 22 as a Vet 65 and then 20 as a Vet 70. Last year when I was not quite 75, I beat 4! This year I improved to beat 7!! I’ve been running at Witton Park since I was 15 and years ago running up ‘The Saucer’ was one of my strong points. Nowadays I can just about run up it on each of the 3 laps. The worse thing that has happened is probably that I can no longer set off ‘fast’!!!! In 2018 I was last at the end of the starting straight, but managed to pass 4 in the next 2 laps but that was it; the others a looong way ahead. This year, 2019, I was last but only by ONE metre and soon overtook others and managed 7 by the finish. The underfoot conditions over the past 2 years have been some of the best that I can remember and even the notorious muddy gate at the bottom of the hill (which the fast guys fly through with no obvious slowing down) was only 3 or 4 muddy strides. Receiving a Lancs. medal standing on the podium being photographed is one of the great things about the Championships and although this year there were less than 10 people still watching as I stood on the top step, I still felt very proud to win a Gold and represent Clayton. Back to back XC races during October, November and December. It weird when your hit with the 4 weeks break. I, and I’m sure others too, was happy when it was back to putting the spike on. 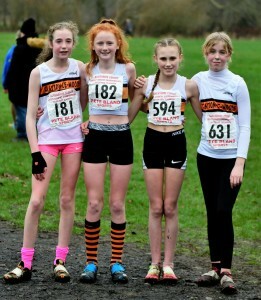 First up (feels like ages ago now) was the Lancashire XC Championships at Witton Park. A fantastic course, drier than previous years but still good fun. Great turn out from the seniors with the ladies team finishing 5th overall. Everyone did fantastic, well done! Also impressive performances by Julia Rushton (2nd V55), Karen Goss (1st V65 and 1st V70) and Christine Leathley (2nd V65) who all finish on the Podium. Week after we were back to Mid Lancs League. Held on our turf, we once again had a good number of ladies taking part. Well organised by Trawden, results were up before I’d even got my spikes out the bag. Being able to hear when Burnley (well Fulham) scored was also a bonus! We had good results and currently ladies stand in the league joint 2nd place in Division 1. V35 – 3rd. V45 3rd. V55 3rd. We need as many as you as possible for the 2 remaining fixtures, please! 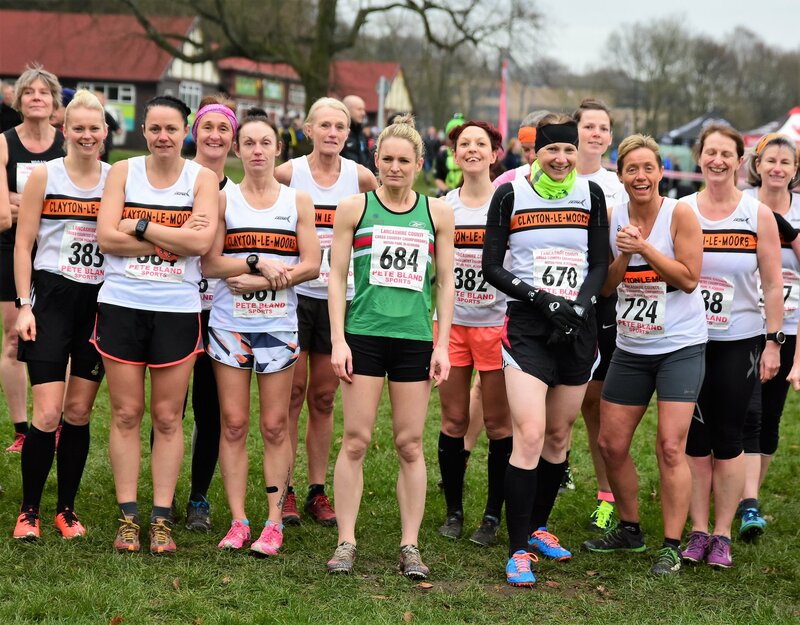 The last January fixture was the Northern Athletics XC Championships held at Pontefract. Thank you to all that put their name forward to represent the club, especially after the committee decided to affiliate to NA so our members could take part in these big events. My 4th year doing the Northerns and a different venue each time. There’s just something special about taking part in this big event, the atmosphere, the talent, the challenge of a longer course. Well done to those who ran and hope you all had a good day out and we see more of you put your name forward next year! The first race of the month was one that many of our Juniors had been targeting all season – the Lancashire XC Championships. Witton Park can be very muddy at this time of year but conditions were surprisingly firm and even the infamous Saucer descent was relatively mud-free. 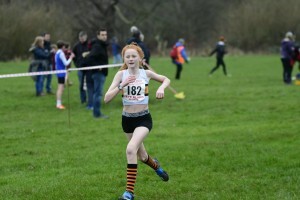 Helana White led the U13G race from early on with her usual focus and took a comfortable win to become Lancashire Champion and achieve her second County vest. 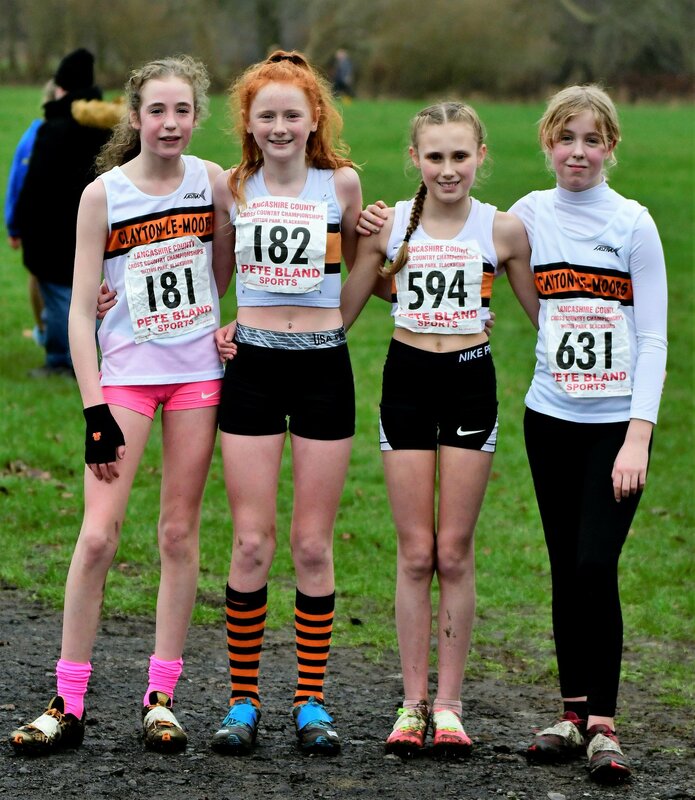 Backing up her win with great runs also, her team mates Sianna Smith (13th), Amelia Halstead (15th) and Eleanor Edwards (23rd) helped the girls to 2nd Team. 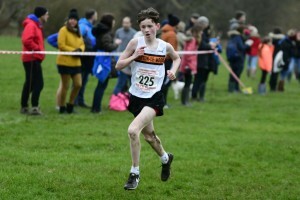 In the U11B, Charlie Fee continued to progress in 17th place and Fraser Anforth was 56th. 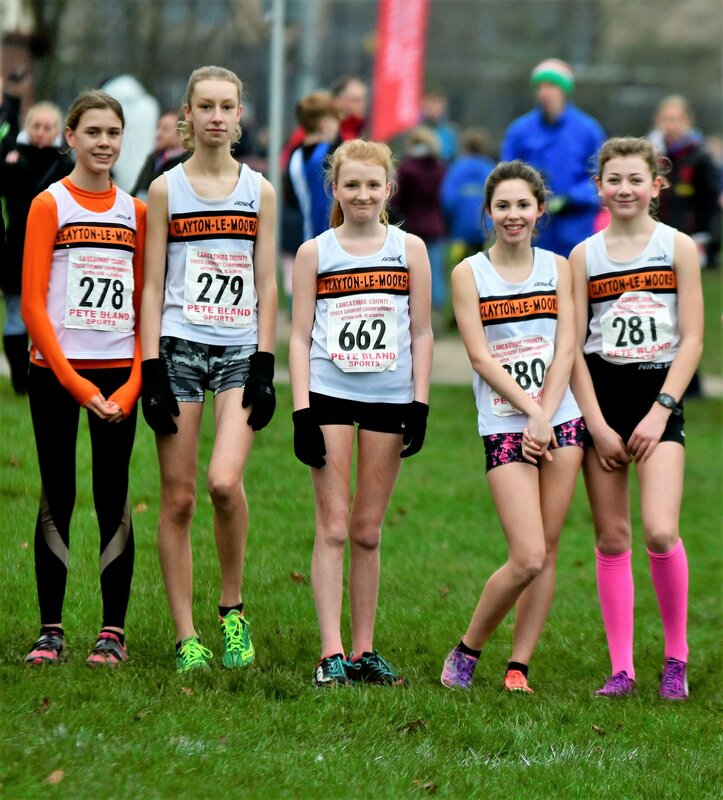 We had 5 girls running in the U11G race, with Eliena Lusty tantalisingly close to the top 10 in 11th, Emily Nicholls 26th, Lottie Smith 35th, Phoebe Jackson 49th and Ellisia Smedley 54th. By comparison, unfortunately we had no boys running in the U13B race, for the first time coaches can remember – here’s hoping the boys bounce back and we can field a good team in future races. 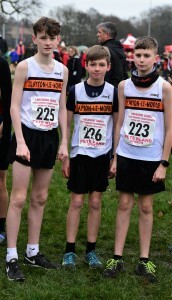 Jackson McKay just missed out on automatic selection for the County team with 7th in U15B so fingers crossed he still gets another vest, whilst Will Nicholls was 27th, Lennon Jackson 42nd and Will Barlow 43rd. 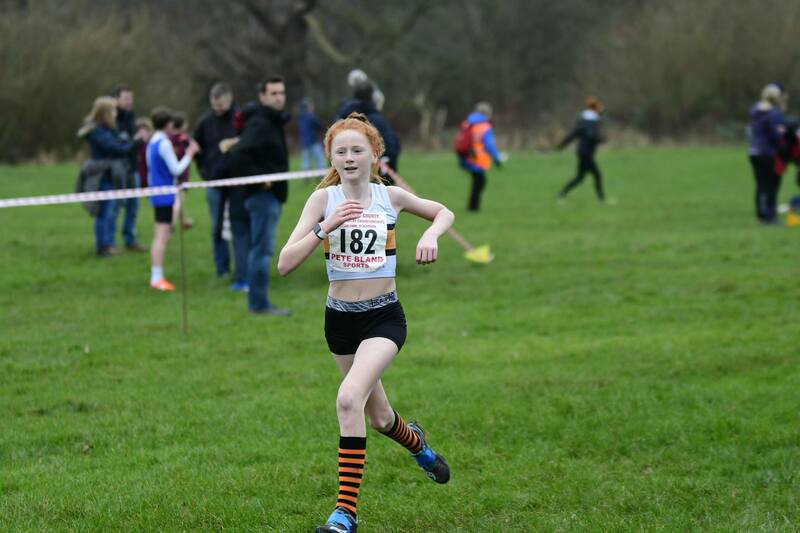 Ella Dorrington led our U15G home in 18th, closely followed by Imogen Ferguson (23rd), Sophie Ashworth (27th), Hannah Eccles (34th) and Beth Wheatcroft (45th). 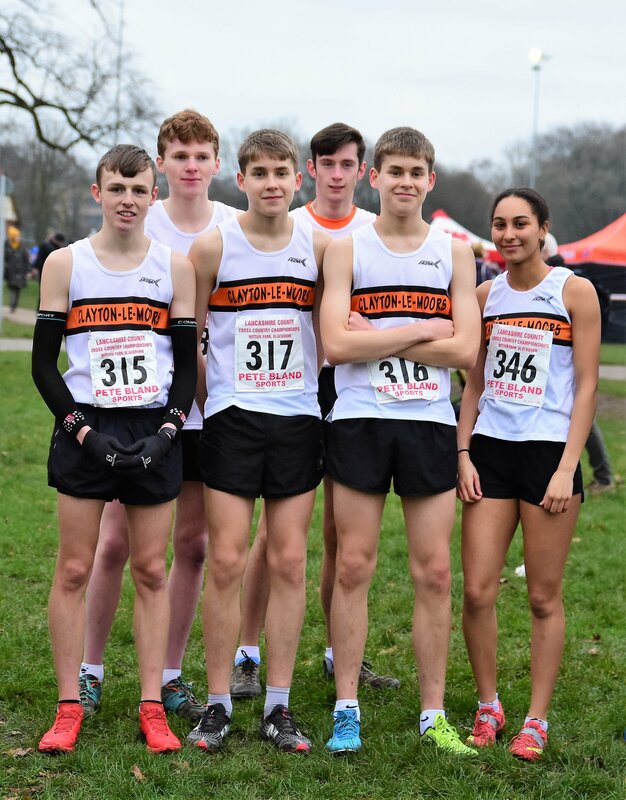 The U17B attacked the race with their usual commitment in a really strong field with Nick Hennessey 17th, Charlie Parkinson 18th, Michael Stevens 24th and Peter Stevens 27th and finally Caleb Thornber 31st. Nicola Moynihan was our sole representative in the U17G race with a fine 9th place. 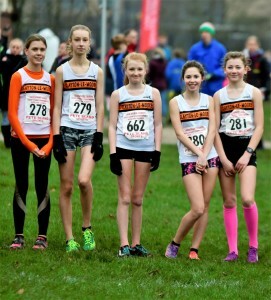 The following week, our cross country Juniors returned to the local fixture in Towneley Park, as part of the Mid Lancs series. There were top 20 performances in the U11 from Eliena Lusty and Charlie Fee, and Helana White took a gritty second in the U13G with Amelia Halstead, Sianna Smith and Eleanor Edwards helping the girls to 3rd team. Jackson Mckay was just pipped into 2nd after a close race in the U15B and with William Nicholls and Lennon Jackson, the boys took 3rd team. Our U17B team was on fire at their home fixture and with Nick Hennessey (4th), Michael and Peter Stevens (9th and 10th) and Charlie Parkinson (11th) they won the team prize. Fantastic work lads! 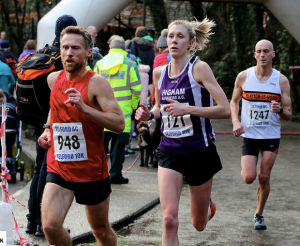 The Kendal Winter League is a well established series of races that can best be described as cross-country on steroids or fell racing-lite. Either way, they are a great way of keeping some fell fitness and experience going over the winter months and fell devotees Ella Dorrington and Christopher Brown attended several during this month. Ella placed 2nd U17G at Giggleswick and 3rd at Whitestones in Cumbria, whilst Christopher was 10th in U15B at Scout Scar, 11th at Giggleswick, and 7th at Whitestones. 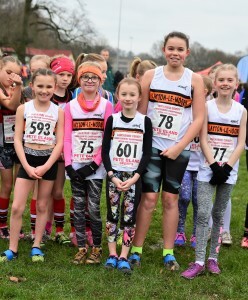 Finally, a sizeable team made their way across to Pontefract racecourse for the Northern Athletics Cross Country Champs, a high quality race with large fields. 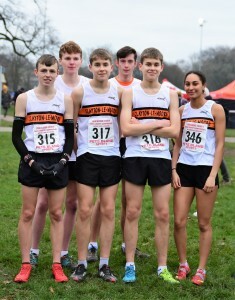 All our Juniors raced well against the best runners in the region, on a fast but draggy course round the infield of the racecourse. 1st F55 – Yvonne Wickham; 2nd M50 – David McMullan. 1st U13G – Helana White; 2nd U13G Team (Helana White, Sianna Smith, Amelia Halstead, Eleanor Edwards); 3rd Ladies (Vets) Team (Jean Brown, Michelle Abbott, Cassie Darling-Smedley); 1st VM75 – David Scott. 1st M50 – David Edmondson; 1st M60 – John Roche; 2nd M45 – Robert Morrison. 2nd U13 Girl – Helana White; 3rd U13 Girls Team (Helana White, Sianna Smith, Amelia Halstead); 2nd U15 Boy – Jackson Mackay; 3rd U15 Boys Team (Jackson Mackay, William Nicholls, Lennon Jackson); 1st U17 Mens Team (Nick Hennessey, Michael Stevens, Peter Stevens);3rd Ladies Over 35 Team (Jean Brown, Rebecca Rimmington, Cassie Darling-Smedley); 1st Vet 70 Men – David Scott; 3rd Vet 70 Men – Richard Lawson; 2 Ladies Over 50 – Carol Life; 3rd Mens over 45 – Craig Eccles. 1st LV70 – Linda Lord; 1st LV60 – Wendy Dodds; 2nd LV60 – Katy Thompson; 2nd LV50 – Jean Brown. 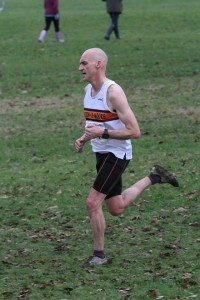 1st V55M – Kevin Davies; 3rd V60M – Alan Clarkson; 1st V55W – Avril Duckworth. 1st LV60 – Katy Thompson; 1st LV50 – Jean Brown.